So you've got a handful of shopping days before Christmas. Maybe you don't know what to get the MU fan on your gift list? Maybe you've been a good fan all year, and are writing to Santa to drop some hints? While you're dreaming of sugar plumbs, here's a great list of items you might see under your tree this year. Tom Crean released a book last month: Coaching Team Basketball .. if you were a good boy this year, you could have gotten a signed copy at one of the 3-4 signing sessions around Milwaukee bookstores. Every fan needs tickets and a T-shirt. $40 bucks gets you 1 ticket to 2 games, plus something gold you can wear to the games. Every true fan needs a media guide. If you're not a season ticket holder, you can buy one at the Warrior Shoppe on campus, or by calling Marquette at 414.288.7447. $20 bucks. If you're cheap and had access to a color laser printer, you could print one out. Basketball fans can order DVDs of games from 1935 to 1990: More than 200 men's basketball games, spanning 1935 to 1990, are now available on DVD. Raynor Memorial Libraries' Department of Special Collections converted the game footage from 16 millimeter film. Archivists used a variety of sources to enhance the description for each game. A complete inventory/index is online and DVD copies may be ordered at $10 per DVD. How about a Todd Townsendreplica jersey? Ok, ok, you could call it a Dominic James replica, too. But my man Double-T went to a Final Four, so every kid wants one for Chirstmas. Of course, there's hundreds of other products atShop.Marquette.edu! There are a few items you can't find at MU's Warrior Shoppe, butBradleyCenterSports.com has this great Marcus West replica jersey and many other Marquette items. Or how about this Marquette Warrior T-shirt ..$25 on eBay! Bid now .. that guy probably only has 18 more cases of those in his basement. Now this is cool. I didn't even know they had this. Golden Eagle Floor Mats, for the politically correct MU fan. Floor mats! Oh, wait, this is even better. A whole page of Marquette carpets .. bath mats, basketball rugs, the works. If you forgot to give your MU friend a book last year, you can make up for it with a book from 2005 .. Tales from the MU Hardwood. Tales of Marquette Basketball takes a look at the high, and low points from McGuire to Crean and everything in between by weaving personal interviews with many great Marquette players and coaches including Hank Raymonds, Rick Majerus, Mike Deane, Tom Crean, Glenn 'Doc' Rivers, Jim Mcllvaine, Travis Diener and Tony Smith as they give insight to memorable moments, both on and off the court. How about the Coach Al McGuire Motivational CD? This CD contains motivational teachings from Coach Al McGuire regarding Leadership, Opportunity, Self-Confidence, and Goals. This CD was narrated and produced by Robert A. Bryd Jr., the last player recruited by Coach Al McGuire. 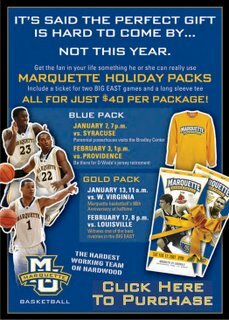 Donate some dough in your Marquette fan's Blue & Gold fund. Or .. for those of you who like books with long titles .. how about "I Remember Al McGuire: Personal Memories and Testimonials To College Basketball's Wittiest Winning Coach and Commentator, As Told By the People Who Knew Him"
Or "Al McGuire: Colorful Warrior". Just search Amazon for Al McGuire. There are too many books to list! But of course, if you're reading Cracked Sidewalks, you really find out why it's called Cracked Sidewalks. Here's the book. BTW check the Orlando Magic boxscores for the next few games as Diener is getting some run thanks in part to attrition. Hopefully he'll find his shot. you can still get the tom crean book with his signature at shop.mu.edu...he signed some extra copies to be sold online during his book signing. it's the same price as the unsigned copies! $25 for a Tshirt sold out of some guys garage??? He must be a UW grad.